To Steve Goodman, the game of life was like the game of baseball…more to the point, a day game at ivy-covered Wrigley Field. Life after all is nothing more than a long season of joy and frustration. 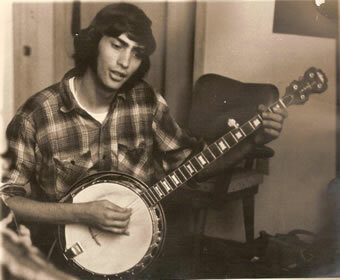 Talent wise, Goodman was the Ernie Banks of folk music…an all-star MVP playing on team folk. To the business types at the record companies, folk may have been pop’s minor league cousin, but no singer songwriter had a higher batting average for belting musical home runs over the fences. With the Chicago Cubs making the 2003 playoffs, and watching Game 6 of this years’ National League Playoff Series, I was thinking about Steve Goodman, and the Main Point Reunion Concert I attended in 1984 with photographer Bob Yahn. That’s the last time I saw Steve Goodman, avid Cub fan and enthusiastic performer. The concert in question took place on June 21, a few months before Goodman passed away, before he made one final risky effort to beat his leukemia, originally diagnosed in 1969. To me, Goodman was a synthesis of many genres, a musical dynamo that processed life and irony into hot licks and sharp lyrics. He could put the most hilarious spin on any subject and get away with murder due to his impish smile and ability to know just how far he could go in his inventive, irreverent humor. That night on the bill with Steve, we had David Bromberg, Bonnie Raitt, Tom Rush and Buskin & Batteau in Marshall Auditorium in Roberts Hall of Haverford College in Haverford, PA. The idea was a tribute to Jeanette Campbell owner and director of the Main Point “for all she’s done for our music and our musicians.” Gene Shay and Tom Rush presented the concert produced by Jonathan Myerow with the support of the Philadelphia Folksong Society. It was bittersweet. Backstage Steve looked ill. He was tired, kind of slumped in his folding seat. He was wearing his blue and red Chicago Cubs cap. But he smiled as we discussed baseball, and the chances for his beloved team. In 1984 the Cubbies were tearing up their Division and looked like potential World Series champions. They clinched the National League East Title with 96 victories in Pittsburgh on Sept 24th, 1984 at Three Rivers Stadium with Rick Sutcliffe tossing a 2 hitter in a 4-1 victory. Ironically, Steve Goodman never saw that come to pass. He died a few days earlier on September 20. Steve missed the National League Championship Series with the San Diego Padres, the Cubs’ first post season appearance in 39 years, which the Cubs lost to the San Diego Padres. It was a case of God seemingly playing a pepper game with Steve Goodman’s fungo bat. On stage at The Main Point Concert, Steve Goodman was his usual bouncy, beaming, dynamic self. When he finished his song “A Dying Cub Fan’s Last Request,” Goodman took off his baseball cap and tossed it into the audience. Like a pop foul ball in game 6…it came to me…”Moises Alou” Deitz. It was there in my hands, but for some inexplicable reason, something made me pull back, and allow the woman seated in front of me to have it. Bob Yahn was mystified. It was as if something, or someone whispered, “No! Let this one go.” Back stage I told Steve that I had choked on the routine fly ball. He laughed and said that next time I should bring my glove instead of my banjo. Recently in Florida, I listened to some FM radio chatter that at first I didn’t understand. Then after a while, it dawned on me. While on a visit to post-World Series Miami, most of the deejays were offering a young man named “Steve,” in this case “Bartman,” free room and board – asylum in the sun. One alluringly voiced woman on a classic rock station had just invited him to stay at her apartment – “indefinitely.” Then I got it. During the Florida Marlins versus the Chicago Cubs in the National League Championship series, Bartman is the 26-year-old Chicago Cub fan who went to grab a foul ball in game six, some say preventing Cub outfielder Moises Alou from catching it. The Cubs were at that point five outs away from advancing to the World Series for their first appearance there since 1945. The fatalists claim this was the turning point in the game, and the series. Even Governor Jeb Bush of Florida cynically offered Bartman an ocean front condo in Pompano Beach…if he needed to get out of the windy city for a few months. I never once heard Goodman’s song played. All I know is the day fans stop reaching for foul balls, is the day you are at a hockey game. If Alou really wanted to be in the stands, he should have bought a ticket. If you are a Chicago Cubs fan, console yourself with the recently released DVD Steve Goodman Live from Austin City Limits…and more! (Red Pajamas Records). It is a fine representation of Steve Goodman’s work, and something to watch while waiting for next year, when maybe Steve’s ultimate request will finally be answered.